Discussion in 'Narrow Gauge Railways' started by AndrewT, Jul 17, 2012. The whole area is good. There are a lot of places to stay - for example the houses on the harbour used to be available for holiday rental (or at least they were 30 years ago) (there is one on Air BnB). (The houses were upside down with the accommodation on the ground floor and the living space on the first flood so you got a good view across the harbour). It depends how large your family is - there are things like self-catering cottages in the area which are also good bases (nice if you like the countryside) outside of Port. The area is good for FR, WHR but you also have WHHR, Llanberis, Snowdon and Bala all within pretty easy reach. TR and Fairbourne are accessible by train from Port. Thanks for your reply, that is all helpful stuff, will have to forward the info on to someone higher up the chain of command so to speak! If you are not familiar with the area it's also worth mentioning that the Cambrian Coast line is not only a good means of visiting various narrow gauge railways, but also connects other worthy destinations - Pwllheli, Cricieth (pleasant seaside town with a castle), Harlech (ditto, although the sea retreated many years ago so these days is a bit more of a walk), Barmouth (I think you can still do a round trip - walk across the railway bridge to Fairbourne, FR train to the ferry, boat back to Barmouth), Aberdyfi (pleasant seaside town with a harbour). The Conwy Valley line has some quite stunning scenery, but get there early so you can bag a window seat on the Class 150 (although I gather it may be a Class 230 next year). The only caution I would make, and it's obvious really, is to check the timetables on any of the railways. Not many of them are remotely "turn up and go" - particularly the WHR and Network Rail! MattA, Forestpines and Monkey Magic like this. Depending on the interests of the family the beach at Black Rock Sands is very nice (or it used to be). You also have all the castles to visit - Harlech, Conway, Caernarfon etc. The Snowdonia National Park has some lovely walks as well to so more serious climbs. There is also the village at Portmerion. The slate mines in Blaenau are also worth a visit as well. Further north but again a within reasonable access you also have the museum at Betws-y-coed and also the Great Orme. Downside is that the weather can be minging. The general approach we had growing up was a ‘dry’ activity if the weather was good (beach, castle, walk) or a wet activity if it was raining (normally a railway - this is why in my mind it was always raining in Bala and Llanberis). Not sure what sort accommodation you are after, but if you are on a budget http://www.basecamp.wales offers nice hostel accommodation between Porthmadog and Caernarfon. Forest holidays also have a nice campsite near Beddgelert which has its own station on the WHR. 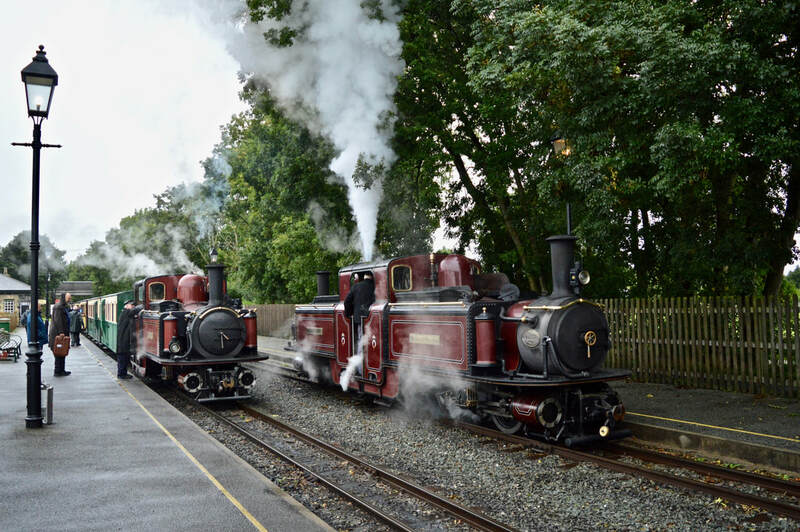 is a cottage in an incredible location with its own private platform for the Ffestiniog railway! I can't reiterate enough what a fabulous area this is for holidays - mountains, fantastic coastline and more steam lines you can ever hope to visit! Lets create history, not just recreate.. I'm not obsessed with steam; I just live, breathe and eat it..
All views expressed are my own and do not represent those of any organisation of which I am a member. The last time I checked, it was essentially booked up as far ahead as it is bookable - to the end of next year. We always try to stay in Port. We like not having to use the car every day. We've used Menai holidays https://www.menaiholidays.co.uk and Snowdonia tourist services (STS) based in Port (https://www.sts-holidays.co.uk/). The South Snowdon Wharf properties are quirky but usually good. Not sure I'd use the one with the water bed again though. Sadly Forest holidays now only offer luxury log cabins and no camping. So its only any good for those with a large budget. Bit of a shame really as it is a great spot. There were rumours that when they had finished the luxury cabins they were planning to open a small camping field too, but if these rumours are true they have been very quiet about it. There's plenty of other places to go if you get bored of trains too. Depends on what you want to spend and what people enjoy of course. I'd also recommend the model bakery in Bleanau. The unique Kurdish pasties are now the staple diet of Ffestiniog train crews. There are lots of places offering outdoor activities like mountain biking, paddle boarding and so on. Llanberis is a good destination. You have 2 railways. The lake railway is mostly flat but nice enough and not too long for those with short attention spans. The Mountain Railway is obviously very spectacular but costs small fortune. Personally if you don't fancy the walk I'd drive up to the first passing loop and watch a few trains go through. The slate museum and quarry hospital are excellent and free. As are the trails around the old quarries and inclines. I've not been in Electric Mountain for many years but it used also to be very good. Beddgelert is beautiful in the sunshine. The river is perfect for paddling in and a walk through the pass is highly recommended. The Ice cream shop is definitely worth a visit too. The museum and miniature railway at Betws-y-coed is worth a look although I think the rest of the town is a bit of a tourist trap. If you like miniature railways there is also the Joys of life railway in Bethesda. They have a Facebook page with running dates on. Of course the scenery is always spectacular every way you look. Plenty of beaches to go to. My personal favourite is at Llandanwg just past Harlech . Nice and quiet, with beach, sand dunes, and rock pools for the kids to explore. The Cambrian also runs right along the sea wall there. There are plenty others of course. Up around Abersoch is popular with surfers if that is your thing. If you don't mind climbing hills and the weather is nice. The walk from Tan-y-grisau up through Cwmorthin quarry is stunningly beautiful, especially if you continue up to the top of the Rhosydd Quarry incline. gwalkeriow, Richieboy and Forestpines like this. For those liking longish interesting walks, leave the car at Tan-y-bwlch, catch the train to Tan-y-grisau, then walk up through Cwmorthin and Rhosydd Quarries, down the side of the Crosoer valley (not down the Rhosydd incline unless you're a manic (I once carried a mountain bike up there as a teenager! ), then back over the gated little road back from Croseor to Tan-y-bwlch. Britfoamer and Bluenosejohn like this. Somewhere with a lot of letters! Speaking with somebody who works there - they will still do camping, but obviously not as much. Does the WHR/FR offer weekly tickets for those staying at the Forest Holidays site? Copper-capped and Forestpines like this. Him work plenty for me. A couple from me of Sunday of the recent 'Super Power' Weekend. The weather wasn't very good for the majority of the day but the clouds did break in the afternoon to provide some lovely afternoon sunshine. Copper-capped and Fish Plate like this.